What happens backstage in the coffee shops, hairdressers’ and delicatessens of this fair land, and how are these baristas and barbers performing for us on a daily basis? SERVUS! 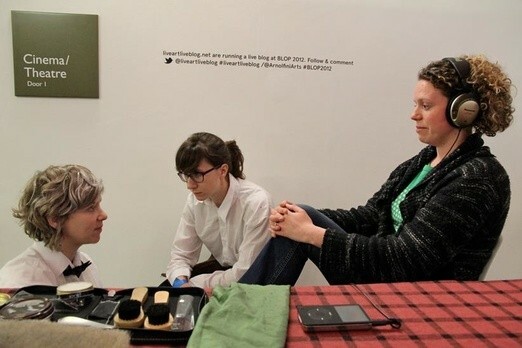 is a one-to-one performance experience for cash, in which the audience member is invited into a bespoke shoe-shine combined with an iPod-induced auditory hallucination. Depending on each participant’s price threshold, he/she might receive simply the soundtrack, the soundtrack and the shoe-shine or – for the thrillseekers – sustained eye contact with the performer for the duration of the shoe-shine. What is service worth to you? Ali Matthews is an American-born performance maker and researcher who weaves participatory experiences out of text, song, and scenographic environments designed to play with certain affects of the theatrical experience: intimacy, distance, desire and alienation. Her work has been presented across the UK and Ireland. Ali is the creative associate for Encounters, a pilot festival of public interventions. Peter Scott Gallery, Lancaster Unversity.